‘…they’re not just songs for radio, and songs to make people happy. These are prayers that we’re praying. Whether it’s in crazy desperation or the highest of joy, these are prayers I’ve needed to pray, and that the church, I think, needs and wants to pray…’ Since his diagnosis if incurable cancer 14 years ago (and given 5 years to live), here stands Tim Timmons, worship leader, songwriter, heartfelt minister, and all round funny guy, who, after his highly successful Provident Label Group debut project Cast My Cares in 2013, is back with another, this time titled Awake Our Souls. On the verge between the musical soundscape of Matthew West meets Shawn McDonald meets Jason Gray (all of whom are very different in terms of musicality and all styles that can be found on Tim’s new album); we are called into the realm of 10 songs, 10 melodies written for the church, 10 prayers you or me or anyone else could pray. And while the concept of awaking our souls, to the beautiful truth, but also to the ugly truth that we sometimes aren’t as perfect as we seem, is a somewhat necessary task, and Tim encourages us to do just that in his new album. While not as flash or even publicised as other new releases this year (if Toby’s new album had publicity 10, this has publicity 2), these songs are very much needed in today’s social landscape as any other. Releasing on the same day as albums from Capital Kings, Gateway Worship, Paul Baloche and Manafest; Tim’s honesty, not just in Cast My Cares but throughout this album as well, makes him possibly one of the most underrated male artists I’ve heard ever since Aaron Shust way back in the day. From the barely three minute toe-tapper “Awake My Souls” to the ever poignant “You are Good (That I May)”, this is a must for any fan of Tim’s previous work, or any fan of modern pop/worship, in a similar vein to Chris Tomlin, Aaron Shust, or Matthew West. Starting off the album with his first single, the title track, we hear within these 3 minutes a whole lot of honesty and heart, as the first lines of the song strikes up a sense of realness and a sense of realisation that we as Christians, or even we as humans, pray in dire circumstances. Or as Tim presents it amongst the hand claps, ‘…a lot of us pray, pray hard with promises made, when times are dark, but few are remembered, few are surrendered…’ Sobering, isn’t it? I am guilty of this, and I’m sure we all are from time to time. Yet what Tim has reminded us is that as we realise that the kingdom of God is here on this Earth as Christ dwells inside us, we can believe and trust in the fact that our circumstances, though not necessarily always favourable, will be used by Him for His glory. Powerfully declaring out for God to ‘…awake our souls, open our eyes to see it, because everywhere the King is, there is the kingdom…’, Tim urges for our eyes to be awakened, to His inherent goodness, to His kingdom here on Earth, to His sovereignty in all situations, and to Him always keeping His promises. A perfect song to start the album with, “Awake Our Souls” brings along with it a passion and a desire to learn more and experience what Christ has in store, not only in our day to day lives but in the big life-changing moments as well. Organic gang vocals layered upon keyboard riffs open up “Like I’ve Been Changed” as this 80s style dance number presents a sobering theme of living like we’ve been changed rather than living like we’re still in chains and are shackled down to our past mistakes, our present failures, and our worries about the future. It is in these simple melodic songs where Tim’s vocals shine, and knowing his story and where he came from in a cancer diagnosis, we can hear the hope, passion and vulnerability, not just in this song, but throughout the album in general. “The Outcome”, possibly one of the most CCM musically cliché melodies Tim has ever recorded, speaks about surrendering the outcome, whatever it may be, to God’s hand. While at times the song can seem a little repetitive (repetitious songs can only be heard in small doses), there is a lyric that speaks volumes, to me, and hopefully to others as well- ‘…unless you build the house, unless you build the room, unless you make it right, it’s all in vain…’ Unless Christ is involved in aspects of our lives, what we’re doing is just going through the motions and killing time, a song that’ll hopefully wake us up to the repetitious mundaneness we can fall into each day. “Rest My Soul” and “Finally Breathing” are some of the more personal songs Tim has recorded, with the former being a moment of realisation where we do indeed need to rest and surrender our troubles over to God, while the latter gives us a reminder that there is a point in our lives where everything comes to a halt and we are given a choice- to continue our existence like we’re going through the motions, or to finally breathe and be able to live out the kingdom of God here on Earth with the full knowledge of our own passion and purpose and what God has placed us on this Earth for. Each of these melodies are slower and sombre, yet seem to me as possibly more poignant and more enjoyable than the faster more radio friendly songs. Which isn’t a bad thing- there has to be room and space on an album for all sorts of tempos, genres and musical different melodies, and both these aforementioned songs fit the structure of slow tempo, powerful theme and impact. Especially “Finally Breathing”, and as Tim states himself, ‘…in this new season, for the first time, not because I’m awesome or religious, but just because, I’m just walking with Jesus, and saying ‘Jesus, I wanna be with You, I am with You, You’re with me, let’s do this together’, I’m walking through life not worrying like I used to worry…I have a freedom that I get to walk around with, that I don’t have to manage the outcome of all these things, it feels like you’re finally breathing…’ This quote alone, ought to have people excited, for not only this song, but for Tim’s album as a whole as well! “Right Beside Me” is a simple radio friendly 4 minute song about us declaring from the outset that God is right beside us ‘…in these moments when I feel afraid, my vision starts to fade, I’m here in the cold, in the dark, though You seem far away, You whisper my name…’, while album ender “All I Really Want” is a simple prayer for us to cry out to our Father, declaring alongside Tim that all we really want is Jesus, and really mean it. A lot of times in the media, we hear professions not backed up by actions, yet what this song, and in essence what this album is encouraging us to undertake is to be intentional about our actions, and believe first rather than doing with a shallow and unbelieving heart. And it is the songs “You are Good (That I May)” and “Spring Up”, the remaining two melodies, that really speak to the heart of the album in general. 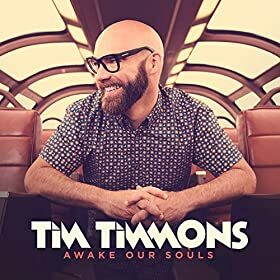 Tim Timmons’ sophomore album, Awake Our Souls, is just as much of a breath of fresh air (or rather more specifically, fresh sounds of acoustic guitars, enthusiastic vocals, and sound biblical truths) as his debut Provident album was. From “Finally Breathing” and “Spring Up” to the title track and “Everywhere I Go”, each song is uniquely different and thematically overarching, as we are presented with the fact that giving everything over to God is more freeing for our lives than we can ever possibly realise. Regardless of what we face, we can have the hope that Christ knows our circumstances, and uses them, good or bad, to elevate Himself and shape us all into the godly men and women we can be as we continue to trust Him more with our lives and the people in it. Fans of artists like Meredith Andrews, David Crowder*Band, Tenth Avenue North and All Sons and Daughters will thoroughly enjoy Awake Our Souls. Dropping on the same date as albums from artists like Capital Kings, Paul Baloche and Manafest, Tim’s new offering is just as enjoyable, maybe even more so, than his previous recording. Well done Tim for such an enthusiastic album, and one of my favourites within the latter half of 2015!